Gunung Tahan is the highest mountain in West Malaysia located in the state of Pahang. It is also the most beautiful mountain that I have been to in West Malaysia. 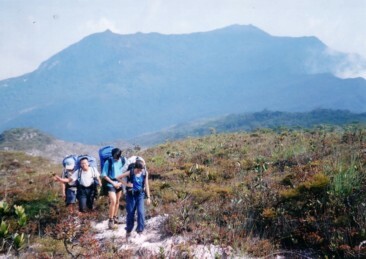 In climbing Gunung Tahan, one can see the gradual change in vegetation from the humid tropical rainforest to the stunned bushes up till waist level at the summit. Traveling from Sungei Relau to Kuala Tahan, we get to pass by many varied terrain, from monotonous ascends, to climbs that requires the help of fix ropes, not to mention the many river crossings that one have to made throughout the trek. The trail is very clean thanks to the strict park regulations which requires all things that is to be brought up the mountain to be inspected and recorded, to be checked again at the end of the climb. Personally, I recommend ascending the mountain from Sungei Relau route and descending via Kuala Tahan. This way, we get the best of both worlds. Sungai Relau is approximately 7km from the small town of Merapoh, which is at the halfway point along the main road from Kuala Lumpur to Kota Bharu, Kelantan. The nearest towns are Gua Musang (30km) and Kuala Lipis (100km). The “traditional” route to summit Gunung Tahan is via Kuala Tahan and back down the same route, however, with the new route from Sungei Relau, it only takes 2 days to reach the summit instead of 3.5 days from the traditional route. The route from Sungei Relau is also easier in the sense that there is less descending compared to Kuala Tahan route on the way to the summit. Nearer to the summit, the view is breathtaking. We also get to camp meters from the summit, giving us a chance to catch the sunrise at the summit. After we have reached Kuala Tahan at the end of the climb, which is also where Taman Negara is located, we can spend a few days relaxing in the National Park. Climbing Gunung Tahan as the name suggest, is not easy. “Tahan” means “Endure” in malay. It usually takes a reasonably fit trekker 2 days to ascend from Sungei Relau and 3 days to descend to Kuala Tahan. Good fitness will ensure that the trek is more enjoyable. Mental strength is also required as one will have to trek in wet socks for almost everyday and the demoralizing terrain especially on the traditional route where there is a lot ups and downs. Near to the summit, the trail gets very muddy and soggy. There is virtually no way of avoiding them. Along the lower reaches of the traditional trail, bees are very common at the campsites but they are really quite harmless. Leeches, there are lots of them. So be prepared to lose some blood. It is advisable to take the train from Johor Bahru railway station as it is much cheaper than taking the ride from Tanjong Pagar railway station. Note: There are a number of cheap hostels across the river. There are floating restaurant across the river. Cost of food can be as low as RM4 for a plate of fried rice. All trips to Gunung Tahan will be close from 15 NOV until 15 JAN every year. Penguasa Taman Negara, Pejabat Penguasa Taman Negara, 27000 Kuala Tahan , Jerantut. The above timings vary from individual fitness to size of group. It should only be used as a very rough guide.